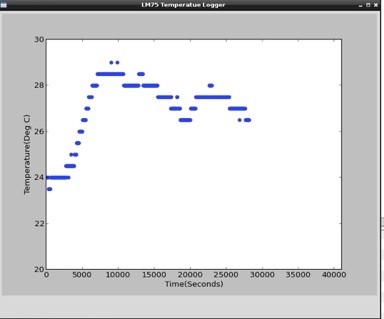 As a follow up to the previous project and inspired by the excellent article in Magpi issue 5 by Dr Duncan Rowalnd, I decided to see if this technique would let me read temperature from the LM75 on the Raspbian operating system. First I am assuming the hardware is constructed as shown in previous project and is connected to a first generation raspberry pi. 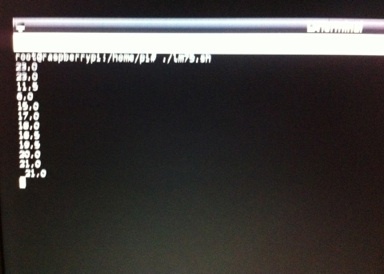 Boot up Rapsbian and then enter the root terminal, I do this via the GUI under the accessories Tab. All good so far... we have at least got Raspbian talking to the device so the basic hardware is working. Now lets see if the Magpi code can convert that to a temperature, be very careful with the syntax here I got it wrong multiple times.....(Change the i2cget -y 0 to i2cget -y 1 if using a rev B Board. Looks like it works, note the LM75 is only accurate to 0.5 Deg C so its a bit of an illusion so we need to limit it to 1 decimal place and round off to the nearest 0.5 Deg C .
This file puts the i2c get command in a loop so every 60 seconds the terminal goes and gets a reading from the sensor and writes it to a new line in terminal like picture below that shows what happens when I apply freezer spray to the sensor. For the next stage in the project see how to link a data feed to update to the web. 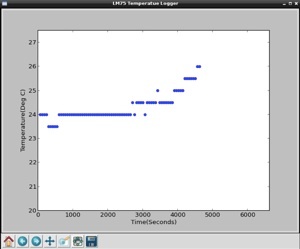 As a continuation to the above project I decided to try an read the LM75 from python and plot it using the matplotlib libary, in order to run this you will need to get the matplotlib, numpy and SMbus python extensions. in above the current limit. variable to set the logging interval in seconds.